I’ve never been a fan of the Grateful Dead; I love rock music, but I don’t like extended jams. But American Beauty, a new small-batch imperial pale ale from Dogfish Head Brewery, intrigued me. Here’s why: Dogfish Head reached out to Grateful Dead fans asking for suggested ingredients for the beer that would honor their favorite band – let the Deadheads supply the recipe. My first thought was, “What sort of ingredients might a nation of Deadheads be inclined to recommend?” Hmm. Perhaps we’d best leave that one alone. The result was more than 1,500 different suggestions, with one clear winner: organic granola. In other words, hippie food. OK, I’ll bite: how does granola work in an Imperial Pale Ale? Quite well, actually, at least in the hands of the Dogfish Head brewing team. American Beauty pours with a big, clean head, a medium-hazy, dark orange body and plenty of lacing. It certainly passes the eye test. But it’s the nose that really begins the intrigue – there’s an expected floral aroma supplied by the plentiful American hops in this beer, but there’s also something else; there’s an earthy tone to it. Does that come from the organic granola? The ale’s flavor is surprisingly balanced – not the hop attack one might expect from an imperial ale (the beer is 55 IBU). It has a crisp flavor, but one which confirms the toasty earthiness on the nose. Upon further inspection, I discovered that the granola includes almonds, which may have something to do with it. Interestingly, this beer is smooth, with a great, natural hop flavor. And yet it’s not one of those Imperial Ales with a flavor or mouthfeel that lingers on. I found this a tad ironic, given the way a Dead concert would no doubt linger. Or a mid-song Dead jam. No, the flavor of this beer clears the palate after a few moments, which means that each subsequent drink is like a fresh start. 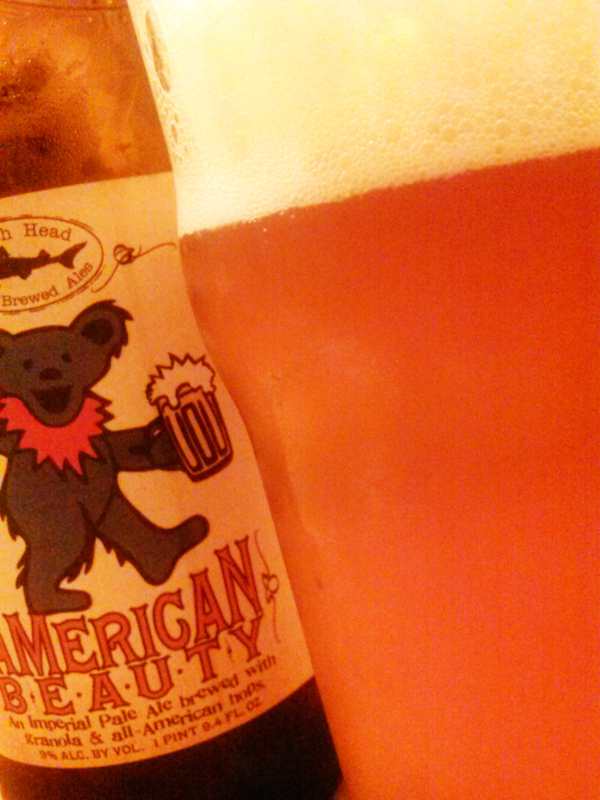 Dogfish Head recommends American Beauty with pork chops, jambalaya or frites, and also with blue cheeses. I had a few nibbles of medium white cheddar while drinking it, and it was only a so-so pairing. I should have checked ahead of time and picked up something more appropriate. Maybe the Dead fans could have made a suggestion. Is Sugar Magnolia a food? But the bottom line is, this one you can enjoy alone or share with a friend. Hats off yet again to Dogfish Head Brewery. In other words, drink up and go home.